I first heard about the High Line at the wonderful Wolfsonian Museum in Miami Beach a few years ago. Julie Bargman of D.I.R.T. Studio, which works on reclaiming post-industrial sites and was also involved in the regeneation of Ford’s River Rouge Plant, described the inspired plan. 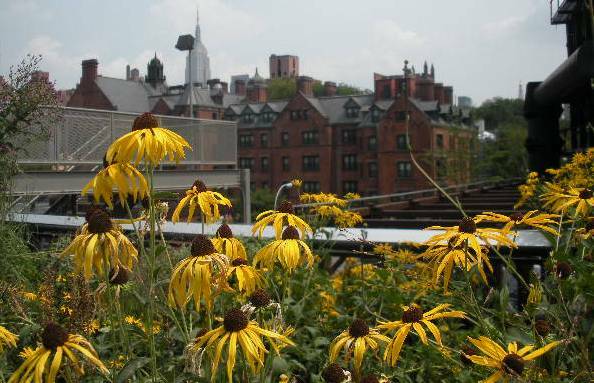 The seeds sprouted into a big success with landscaping along the abandoned elevated railway tracks a glorious park full of flowers, trees, plants — and people — adding color and texture above Manhattan’s lower West Side. And now it’s extending northward. 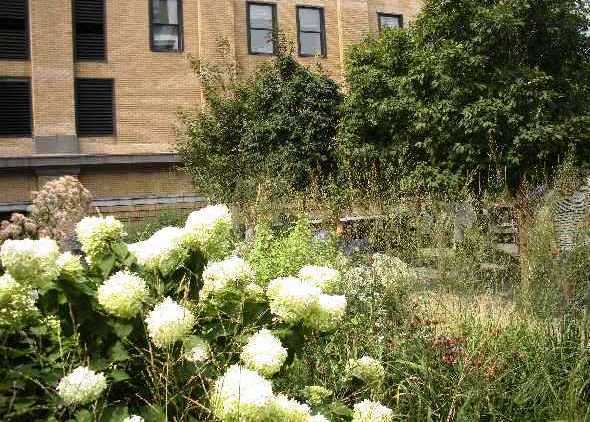 Like different rooms, a series of areas unfolds, including the Chelsea Grasslands with drought-tolerant grasses and drip irrigation to keep it green. A compost tea of natural fish fertilizer and molasses or flour for bacteria and fungi is brewed overnight. I like these rail-like troughs above mixed with the real rails. Julie referred to the importance of integrating parts of former industrial sites as an homage to our history. 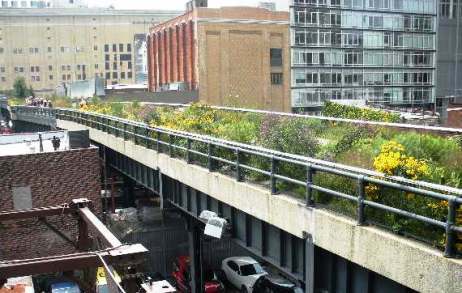 The High Line is a brilliant tribute, showing how this revitalization adds value with much-need green space in the city. Perennials, grasses and shrubs include lots of native species. Pearly Everlasting and Red Cauli stonecrop were planted as well as hydrangeas. 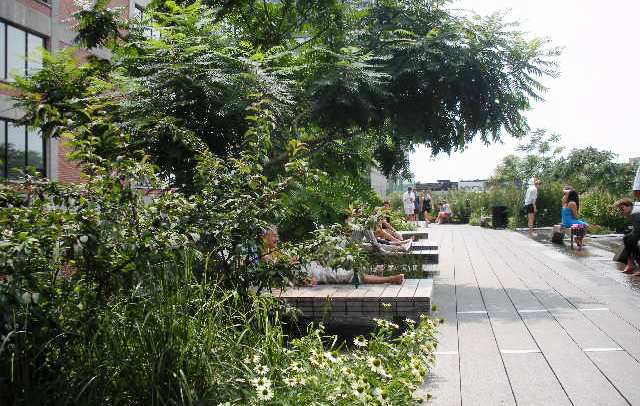 The High Line’s Sundeck dotted with coneflowers, Baby Joe pye weed and sunbathers. Year-round blooms include witch hazel in winter, asters in fall, compass plants in summer. Check with Ask-a-gardener for details on plantings. NYC: Tolerant of beliefs, judgmental of shoes. 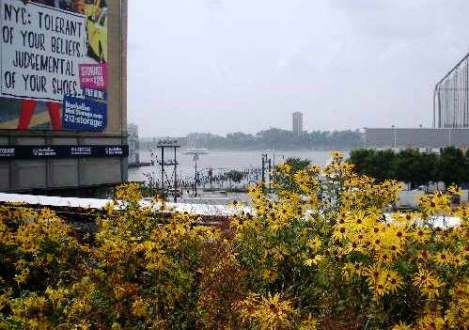 Billboards at eye-level share view with wildflowers at the Hudson River Overlook. This industrial mix with nature is my idea of urban heaven. 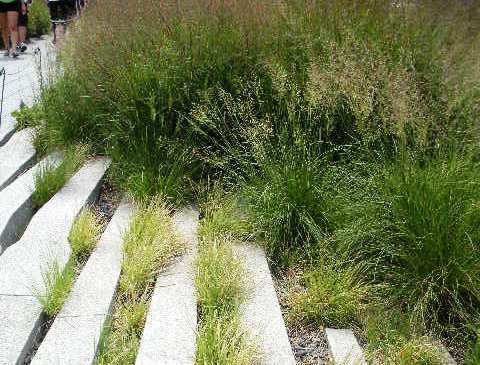 The High Line landscaping was designed by James Corner Field Operations and Piet Oudolf with architectual firm Diller Scofidio + Renfro. It’s a must-see spot on any visit to Manhattan. 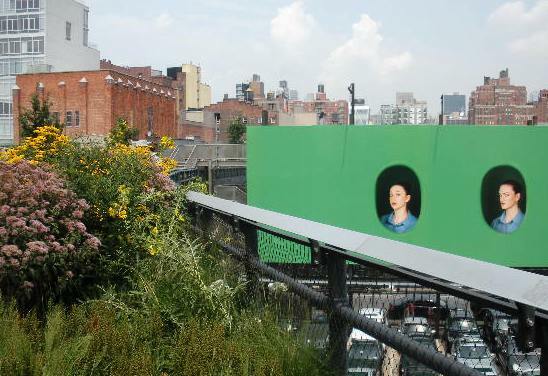 This entry was posted in Art and Design, Green ways, Travel and tagged High Line, New York City, urban gardens. Bookmark the permalink.